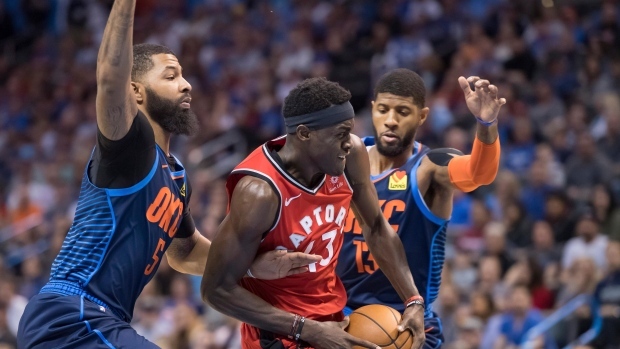 OKLAHOMA CITY — Forced to play overtime after blowing a 20-point second-half lead, the Toronto Raptors found their groove again in the extra period. The Raptors did so with balanced scoring, good ball movement — four players had six assists — and strong shooting, making 51.7 per cent overall and 38.9 per cent from 3-point range (14 of 36). Kawhi Leonard added 22 points and 10 rebounds, while Danny Green scored 17. "A lot of times when you blow a lead and go to overtime, the momentum goes to the team that gets it to overtime and you come out flat," Toronto coach Nick Nurse said. "But we didn't. We came out and really played, really played, especially at the defensive end, which is a great sign." "I knew it was close," Oklahoma City's Paul George said. "If we win (we know) where we're at and if we lose we know where we're at going into the game. We control our destiny." "As we get closer to the end (of the season) here, where it's less about foundational principles and more about getting locked in and playoff-type defensive packages and coverages, tonight you saw that a little bit," VanVleet said. "Things are getting a little more detailed and guys are revving it up a little bit more." George scored 19 points for Oklahoma City, which made 13 of 43 3-point attempts (30.2 per cent) and 15 of 29 free throws (51.7 per cent). "We've just got to get off to a better start," George said. "That's it. A better start. We close out well. We just put ourselves behind a lot of times. Just a better start." The Thunder retired Nick Collison's No. 4 jersey in a pregame ceremony, the first time the franchise has so honoured a player since its move to Oklahoma City in 2008. The Seattle SuperSonics drafted Collison out of Kansas in 2003 and he spent his entire 15-year career with the club. Raptors: Nurse didn't seem too concerned about Lowry's injury: "He's just sore. Nothing serious. They've checked it every way it can be checked." VanVleet started in Lowry's place. ... Siakam's double-double was his 16th of the season. . Toronto's 21 wins against Western Conference foes this season are a franchise record. Thunder: Consecutive games against an opponent aren't new to the Thunder. OKC played at Dallas on Dec. 30 and hosted the Mavericks on Dec. 31. ... Backup C Nerlens Noel returned after missing one game with a bruised left quad.